The Resident Tourist: Cultural Adventures . . . I've had quite the week of cultural adventures, if I do say so myself. Last night I saw the Boston Symphony Orchestra play at Carnegie Hall, tonight I'm going to a painting course at Paint Along NYC, and Tuesday night I took a cooking class at the new Sur La Table store on 57th Street. Cooking, music, and painting, all in one week. Sigh. I'm a lucky girl. I'll let you know how the painting goes, but if you have any interest in getting better acquainted with your spatula and sauce pan, I'd highly recommend taking a class at Sur La Table. The whole experience was just fabulous. If you go with three friends, you'll get your own butcher's block and work as a team. It's really fun! And surprisingly easy (I'm a bit of a disaster when it comes to the kitchen). The class is lead by a head chef along with three cooking assistants. 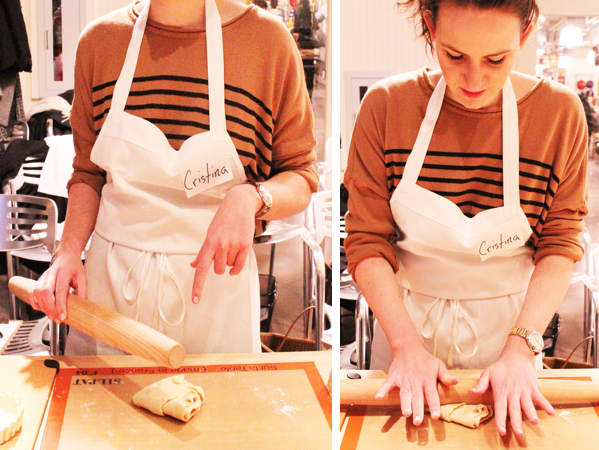 They set up all the equipment and provide aprons and name tags. After the class you get to eat the meal you've put together as well as shop through the store with a 10% discount. It's really a wonderful way to spend a week night - try for a double date or make it a girls night out. Take a peak at the classes offered HERE. 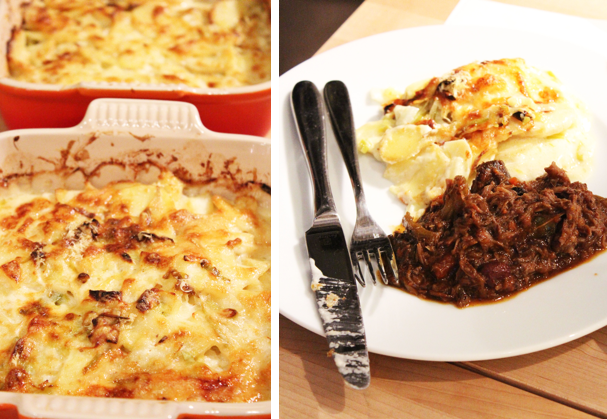 We took a French Bistro Classics class - very country, very rustic, very yummy. The class was lead by chef Judi Rose who taught us all the tips and tricks on making an easy and delectable French-bistro-style meal. We started by making a roasted potato and fennel gratin, and then whipped-up a thyme and fresh Chevre tart. Next was the main course of Gamay-braised lamb shank with Nicoise olives, followed by a dark chocolate and cherry clafoutis for dessert. Every bite was like taking a tiny trip to the French countryside. It was hard to believe that we made it all ourselves. Here are some pics from the night as well as the recipe for the clafoutis (personally, my favorite dish). If you want any of the other recipes feel free to email me - I didn't want to clutter the post - but I'm more than happy to share! Preheat the oven to 400 degrees, place 11x7x2 inch baking pan inside. Mix eggs, milk, melted butter, vanilla, flour, sugar, and salt in a food processor. Process until completely smooth. Set aside. Remove hot baking pan from overn and add butter, swirling the pan to coat. Place pan back in oven to continue heating. In large saucepan over medium heat, add cherries, sugar and amaretto, stirring to combine. Cook until sugar dissovles and cherries are headed through, about 5-7 minutes. Remove hot baking dish from oven and immediately pour in half of the batter. Quickly pout the warm cherry mixture evenly over the batter. Pour the reamining batter evenly over the cherries. Sprinkle with choped chocolate and place pan in oven. Bake until the clafoutis is golden and set in the middle, about 30-35 minutes. Remove pan from oven and allow claufoutis to cool slightly. Serve warm and enjoy. This looks really good - have any left? Sadly no leftovers, I'll try to make it again for you!